One of my students made in public speaking class. Mallory works at the Farmer’s Market and has told us all about hot peppers and now how to make a unique salsa that tastes great. Mallory said that she decided to surprise her mother with homemade salsa for her birthday. One of Mallory’s Hispanic friends agreed to teach her how to make authentic salsa. It was a hit, and now it’s a family favorite. I asked Mallory if she’d share her recipe and a photo of her making up this zippy treat. She said she’d be glad to and sent her recipe right over for all to enjoy. Boil tomatillos for about five minutes or until they turn a mossy green color. 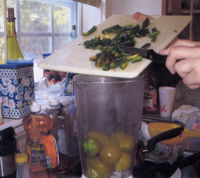 Cut up the jalapenos and take out the seeds. If you put the seeds in this salsa it would be super hot. It's plenty tangy sans seeds. Serve with your favorite nacho chips. The class really enjoyed this treat, and I'm sure readers will too. Green Salsa tastes similar to tomato-based salsa but has its own unique twang.